I like the feel and comfort of this item. It is simple and complimentary for the person that wears it. 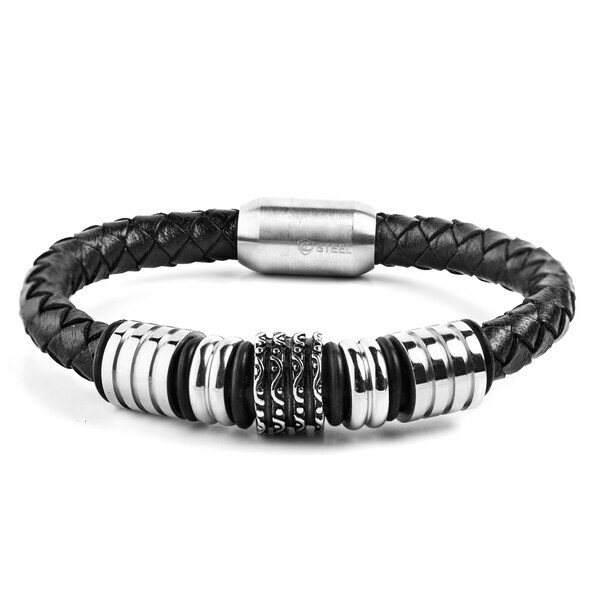 This eye catching bracelet features a black braided leather bracelet with contrasting stainless steel beads. The stainless steel grooved beads and wavy designed bead offer a sleek and rugged look. The bracelet encloses with a magnetic clasp. The bracelet measures 11.5 mm wide x 8.25 inches long x 11.5 mm thick. The weight of the bracelet is 29 grams. Dimensions 8.25 In. X 0.45 In. X 0.45 In. I bought this stainless beaded bracelet for my wwife for Christmas. She loved it. Great price. nicely crafted. The magnetic clasp is grreat. Beautiful,well made bracelet. Looks very expensive. Strong metallic clasp. We've gotten many positive comments. Can be worn anywhere. Easy to dress up or down. This bracelet paired well with the Invicta Men's 21735 Aviator Quartz Multifunction Black Dial Watch. AMAZING!! I ordered this as a gift and was very impressed with the good quality. He loved it and says that it wears well. He can wear it casually or dressed up. Good work Overstock. It was also delivered in a nice navy suede pouch and made a good presentation. I will order other Crucible items in the future. Good quality, tightly braided, very cute bracelet. This bracelet is not only pretty but durable. It looks good on the wrist and can be worn as dressed or casual. Bought this for my husband as a gift. He loved it. Easy to get on and off. wears well, you can dress it up and down so it's casual or dressy. Perfect piece. I choose this because it looks masculine.